A walking path in Windrush Gardens. Photo by Andrea Laborde Barbier. 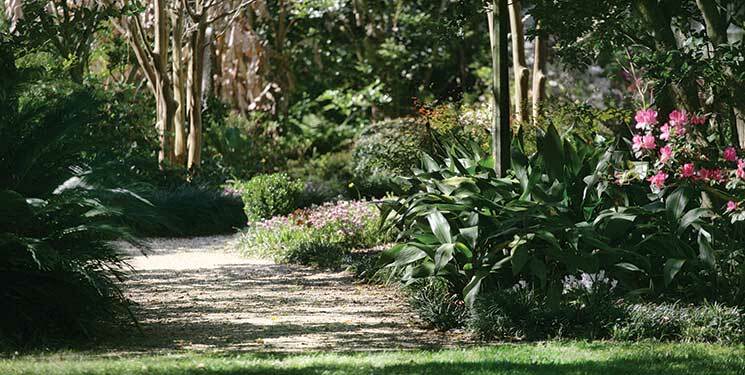 Steele Burden is known throughout Louisiana for his work as LSU’s longtime landscape designer. From 1932 through 1970, Burden oversaw the campus grounds and is credited with planting many of the live oaks, crepe myrtles and azaleas—keeping in mind as he did so that they would be enjoyed by future generations. “Campus is going to change with time, but his impact remains,” said Jane Paccamonti, curator of the LSU AgCenter’s Windrush Gardens. Windrush Gardens, now part of the LSU AgCenter Botanic Gardens, was Burden’s private experimentation grounds for determining which plants would work at LSU. The picturesque gardens, once five acres, now encompass 25 acres and are preserved in part through private funds. One such fund is the recently donated Windrush Gardens Student Stipend. Luna, a landscape architecture student, engages in work that ranges from hands-on care of the gardens to mapping out plantings for Windrush’s annual Cultural Landscape Report. As a guide for the maintainance and rehabilitation of the gardens, the report is imperative for maintaining and preserving Burden’s masterpiece; it includes information about which plants Burden wanted on the property and contains a historical analysis of the site, as well as directives for the future.